Looking for a safe and secure place to store your firearms that will prevent them from being stolen, but provide convenient access? This handcrafted solid wood gun cabinet is the perfect solution. 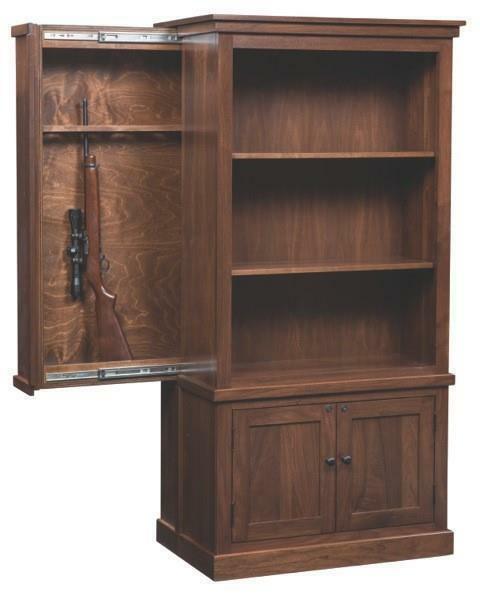 Hide your gun collection in plain sight with our Cambridge Bookcase with Hidden Gun Cabinet. The hidden compartment at the back of this bookcase will hold up to six rifles and is skillfully crafted to completely hide the gun rack concealed behind the bookshelves. This secret compartment comes standard with a lock at the top of the bookcase to restrict access to children or anyone else that knows about the hidden compartment. Choose from a variety of felt colors that line the gun rack to protect your rifles from scratches including blue, burgundy, green, or brown. The bookshelf features two adjustable shelves for a variety of storage options. Also, the bottom cabinet features one adjustable shelf and secure locks on both doors, making it the perfect storage space for ammo, hand guns, and firearm accessories. Contact our DutchCrafters team of furniture specialists for more information on this heirloom quality gun cabinet.